I entered 2015 with the idea that I will not make New Year’s resolutions because I didn’t keep mine last year…one of which was to write something, whether it be a note or blog, every day. I’ve since read why New Year’s resolutions don’t really work. We are creatures of habit, we have good intentions, but life often gets in the way, and that certainly proved true last year for me. On November 24, 2013 my dad came to live with us after being diagnosed with chronic lymphocytic leukemia, a common disease in elderly people. John and I had to do a good bit of talking to convince him to move in with us, but he finally agreed. We had no idea what the future held when Daddy came here. I told him to pack enough clothes for the winter at least, and a few things for spring. He brought mostly winter clothes; I think he had in his mind all along that he would return to North Carolina. Dad’s treatment began on December 3 with an infusion of rituxan (rituximab?). John and I took turns sitting with him during his first treatment. I didn’t have much vacation left at work, so I needed to be there as much as possible, but I knew it was important to be with Daddy too (more so than being at work). Daddy did fairly well except he began shivering uncontrollably after he got up to go to the bathroom. The nurses were attentive and gave him something to stop the shivering. He was a real trouper and didn’t have any ill side effects other than fatigue from the treatment. 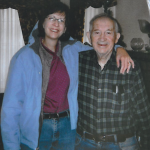 We were blessed to have a nurse practitioner from our church who worked at the doctor’s office; she did the initial assessment of my dad and was supportive through the whole time he was undergoing treatment. Along the way I began to appreciate my husband more each day. Self-employed, his schedule is a little more flexible than mine, so he assumed most of the responsibility of taking Daddy to doctor visits, which became quite frequent, especially after Daddy complained of back and leg pain, had a scan, and the oncologist determined that his pain had nothing to do with his leukemia. We set up a primary care physician for Dad, and monthly visits ensued. I would like to say that the year (13 months) Daddy stayed with us were a breeze, but they weren’t. He was a good patient and usually was pleasant to be around (a real blessing). 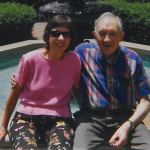 John and I had added responsibilities, like picking up medications and buying certain grocery items for Dad, and I undertook the weekly bath routine. Daddy took care of daily sponge baths, but the all-over bath on Saturdays required assistance. Some weeks I nearly forgot, or I was exhausted by the time Saturday night rolled around. There were time I had to go into “bossy daughter” mode, and Daddy usually accepted what I said. He got a little depressed from being housebound and isolated. We tried early on taking him to church with us on Sundays, but that proved to be too taxing. Daddy’s back and legs hurt after sitting for a couple of hours, and moving him from our Sunday school class to the sanctuary was quite a feat. John was my support and reality check throughout the year. Around September he started pushing me to start looking for assisted living. I was reluctant, feeling a bit guilty about leaving my dad’s care (or the brunt of it) up to others, but really the whole situation was starting to take a toll on my mental and physical health. Not to mention the pressures on John’s and my relationship. Then when my dad took a couple of spills at our house in November 2014, we got serious about looking for assisted living. Daddy had been on the waiting list for assisted living in Canton, NC, where he had lived for the past 20 years, but it looked like we might be waiting a while on that. So the week of Thanksgiving I started looking around Nashville for a place for Dad (using, ironically, a website called A Place for Mom). I had a helpful representative there who immediately called me as soon as I registered on the website, and she suggested some places near our home to check out as possibilities. The search began the week after Thanksgiving, and we soon narrowed it down to two places, one 2 miles from our home and the other about a mile from my workplace. Then I told him about the e-mail I’d received from the admissions director at Silver Bluff. Immediately his eyes lit up, and I knew what the outcome would be. That night I e-mailed her back and told her Daddy was interested in the available apartment. Daddy’s last words to John and me as we left about 5:30 p.m. on Tuesday were, “I’ll miss you and John waiting on me!” He also said he loved us, and he told John for the first time in our 32 years of marriage, “I love you. You’re a good son-in-law.” That is undoubtedly true. Now the adventure continues…keeping in touch with him and trying not to worry. He is happy with the food at his assisted living. He’s having to walk more (with his trusty walker) to get to the dining room and activities room. He has accepted his new situation with grace and a positive attitude, despite the stress of having to march to someone else’s routine. I am happy that he is back with people his age and that my stepsister and stepbrother are nearby. We will have our challenges, I expect, but for now life is very, very good. On a recent trip to North Carolina to care for my dad before and after surgery, I got a glimpse of what full-time caregivers go through every day. It’s an understatement to say that caregiving takes a lot of emotional and physical energy. I arrived in Canton on Monday, April 11, having decided after talking with my stepsister, to accompany Daddy to his appointment with the urologist on Tuesday. Supposedly it would be a decision-making meeting, but the doctor had already decided what procedure he would perform on my dad: a button TURP (transurethral resection of the prostate) to remedy his BPH (enlarged prostate). Daddy sat quietly (perhaps cowed) during the discussion; I asked a few questions, having done my homework–I read up on the procedure and other prostate procedures on the Mayo Clinic and Cornell University websites. The urologist mentioned that he hoped the button TURP would correct my dad’s problem, but that it might not–part of the problem might be his bladder not emptying properly. He said Daddy’s bladder walls were thickened, and the bladder wasn’t as elastic as it used to be, so urine could pool in his bladder. At that point I decided we’d heard enough; we needed to focus on getting through this surgery instead of talking about what-ifs down the road. So Daddy signed the consent forms for his surgery, and we were off to the drugstore to get an antibiotic for him to take before surgery (the doctor said he already had a urinary tract infection from wearing a catheter for two weeks). We went to the drugstore and grocery store, and by the time we got home, Daddy was pretty tired. His arthritis affects his legs, and he can’t stand for long periods of time without hurting. I started cooking, my cure-all for stressful times. I particularly enjoy cooking for Daddy, because he’s such an appreciative audience. When I tell my husband, John, what I’ve cooked for dinner on my trips to NC, he says, “Boy, he’s eating like a king!” rather jokingly, as I do cook some of the same dishes at home when I have time. On Wednesday we went to the hospital for Daddy’s preop bloodwork and EKG. It was a challenge to get there by 9:30 (old, arthritic bones move slowly in the morning, but we made it on time and were done by 10:00. Amazing. Then came Thursday, the day of Daddy’s surgery. That morning he wanted to talk about where important papers were and what he wanted at his funeral. We’d sort of talked about his funeral before back when he had a quadruple bypass at age 80, but we hadn’t talked in quite as much detail. I kind of gulped a bit, thinking about the real possibility of Daddy dying. After what seemed like forever (the surgery was scheduled for 2:45, and Daddy was brought back to the room around 4:45), the nurse and assistants wheeled him in his bed back to the hospital room. Daddy was looking around trying to make sense of it all. He didn’t say anything for a bit, and then finally he said, “I didn’t get to see the doctor. Did I really have surgery? I remember everything they said while I was waiting.” Before long, he asked when he would get to eat (a very good sign). And he ate every bit of the meal that was brought a few minutes later. On Friday we went home from the hospital. Daddy had not walked in the hospital except to go from his bed to the bathroom with the nurse’s help. I began to get a little panicky at the thought of getting him inside his house, which has steps leading up to the kitchen. We got out “Mr. Walker,” who became my dad’s best friend for the next several days. Daddy got inside the house okay; I walked behind him to be sure he didn’t lose his balance and topple backward as he climbed the steps. We got him settled in his chair in the living room, and then it was time for medications. I started a list of meds and times given; it wasn’t quite as hard as after his bypass surgery, when he had more medications to keep up with. Soon after that, I went to lie down for a nap. I was exhausted after the stress of the day of surgery, then rushing to the hospital on Friday to meet with the doctor while he was on rounds (thankfully not until 8:30). I think I slept for about an hour and a half. Daddy also rested during this time. As I drove home to Nashville, I reflected on the week of caregiving and how I’d cooked and washed dishes more than ever before…and how I’d learned to change from a leg catheter to a Foley (regular hospital size) catheter…and how tired I suddenly was. Then I realized that so many people taking care of loved ones don’t get a break, and some care tirelessly (or not) for people who aren’t so vocal in their thanks as my dad was. Daddy had actually said to me at one point, “Oh, I don’t deserve to be taken care of like this.” I replied, “Yes, Daddy, you deserve every bit of care that you get, because you’ve taken such good care of Mommy and Helen.” My dad has been in the challenging position of being caregiver to two spouses. I feel grateful that I had the privilege of helping my dad. I also am grateful that my stepsister Juanita, who lives next door to my dad, checks on him every day and, along with her brother, has taken him to countless doctor visits and taken care of many little emergencies that have arisen with him over the years. It’s really hard living 5 1/2 hours away from Daddy. I’m the only child in our family, and I wish he were here. Maybe someday he’ll get to move to Nashville. Right now Helen is in a nursing home; she turned 93 the day Daddy came home from the hospital. True to his usual habit of remembering birthdays, he’d arranged for a cake to be served in her honor at the nursing home. So I’ve rambled long enough…I’m just very grateful that Daddy dodged the bullet this time. I think he still has a few more years left in him. As the nurse who took him to surgery remarked, “He’s a World War II veteran.” “They” just don’t make tough people like that anymore.